Today I’m excited to have Sara Haas, the co-author of Fertility Foods and that strong woman who’s on this roller coaster herself here to chat with us. Sara has some excellent insight on fertility and the rocky road to baby so I’ve invited her to post here too. I think we can all find value in her insight! Please join me in welcoming Sara today. 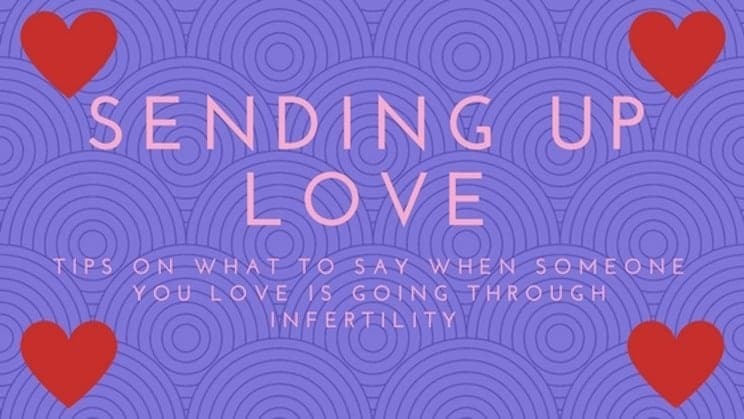 It’s hard to know what to say to someone going through infertility. It’s even harder to know what to say when they reach a pivotal part of their treatment. What can you do and how can you show your love and support? Even if you’re the one struggling with infertility, these tips can be helpful. Share them with friends and family so they can offer support in the most beneficial way. If applicable, tell them you love them and you’re there if they need you. Period. You don’t need to say anything more than that. Hearing those words is sometimes all that’s needed. Let them take the reigns in terms of how much they want to share. Do something thoughtful for them that doesn’t involve fertility. Take their mind off of the crazy whirlwind of fertility treatments by sending a box of their favorite tea. Share a link to your favorite food/lifestyle blog. Loan them a great book or take them to lunch or a yoga class. Say a prayer for them. Whether you’re religious or not, a prayer is never a bad thing. Pray to God or whomever or whatever you believe in. It’s a small, but meaningful gesture. Bonus – this one can be done anytime and anywhere! Right now our dear friend Liz is at a pivotal part of her infertility journey and needs our love and support! Let’s send positive vibes her way utilizing 1 or all 3 of the tips above! And then when you’ve done those things, go out and make one of her favorite recipes! Loaded Lean Nachos! How could you not love this recipe!? Loaded is right, and with all of the good stuff! Share your pics of your Loaded Lean Nachos on your social account and tag @bumps2baby to show your love and support! Do you have more tips? Feel free to drop them in the comments section below!